Kevin Gosztola; Nathan Fuller day 1; Nathan Fuller day 2. 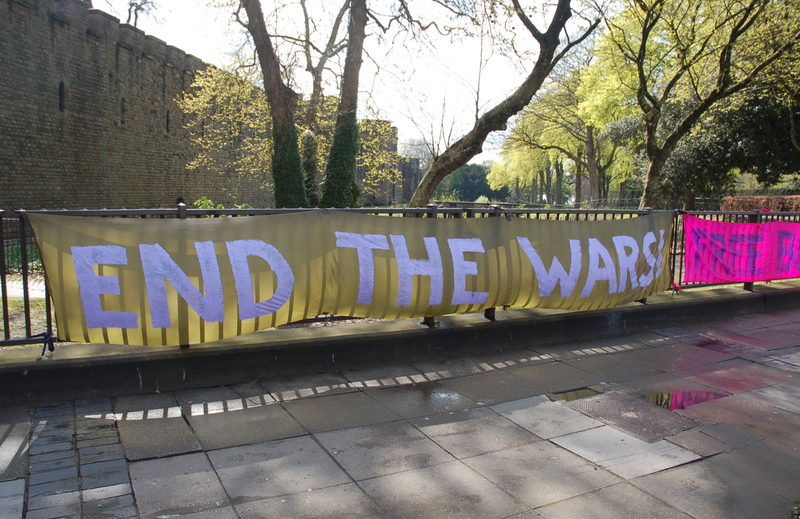 Supporters in Cardiff held a day of solidarity to mark the beginning of the current court hearing which runs 24-26 April. 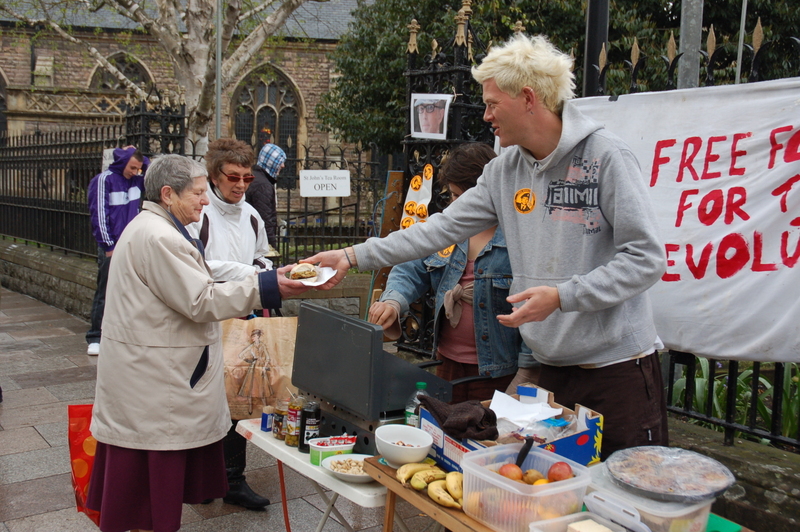 Food Not Bombs Cardiff and other Bradley Manning supporters from Cardiff, Newport and beyond held a ‘Free Food. 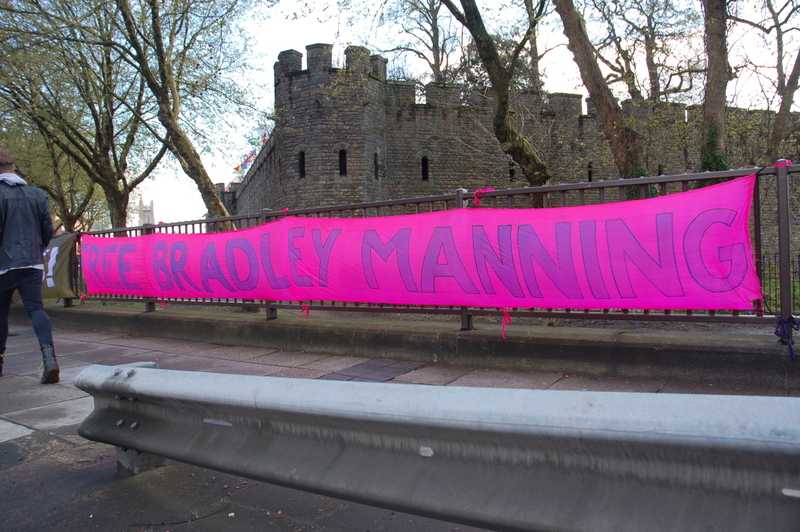 Free Bradley Manning!’ event with free vegeburgers and an information stall outside Cardiff Central Market between midday and 2pm on Tuesday 24 April. 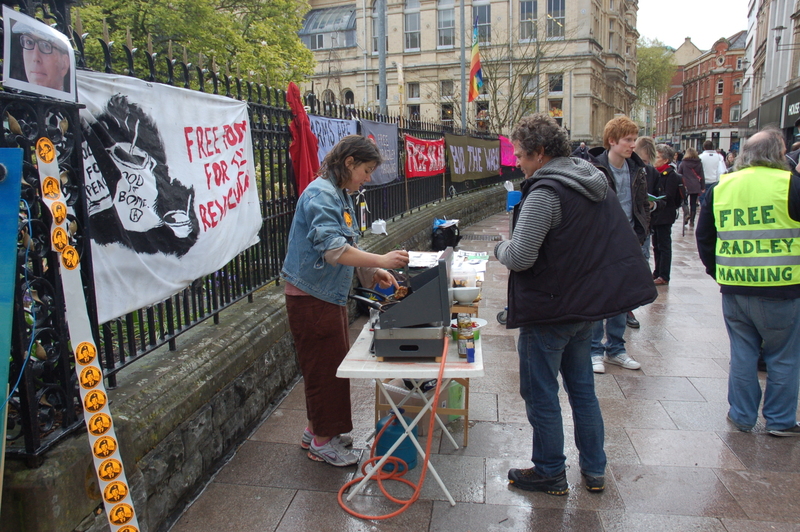 Dozens of hot burgers, along with flyers, stickers and badges were handed out in between the heavy showers. Many people stopped to talk about the case and some wrote letters to Bradley. All the letters we’ve collected during the three weeks we’ve been touring Wales will be sent to Bradley after the current court hearing. For details of mailing restrictions etc. see here. 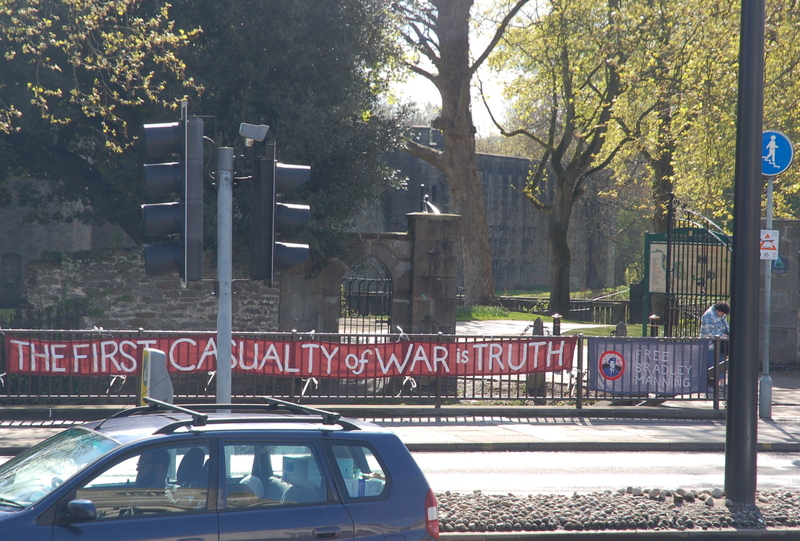 The Food Not Bombs event was followed by an unplanned banner hang at a busy road junction outside Bute Park from 3-5pm to dry them all off after the earlier rain. Around 50 people attended the ‘special sneak preview’ screening of Jim Spione’s Oscar nominated short documentary ‘Incident in New Baghdad’ on Tuesday evening. 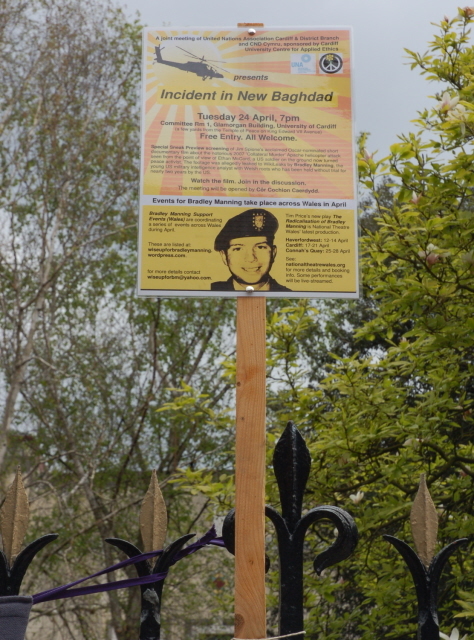 The film tells the story of Ethan McCord, the US soldier on the ground who arrived on the scene immediately after the ‘Collateral Murder’ US Apache helicopter attack on civilians in a Baghdad suburb in 2007. Ethan rescued two injured children from the van in which their father had been killed in a further attack launched while he was going to the aid of one of the initial victims. In 2010, Ethan wrote a public letter of apology [letter; report] to the Iraqi people along with a fellow US soldier Josh Stieber and now speaks publicly across the US against its wars. 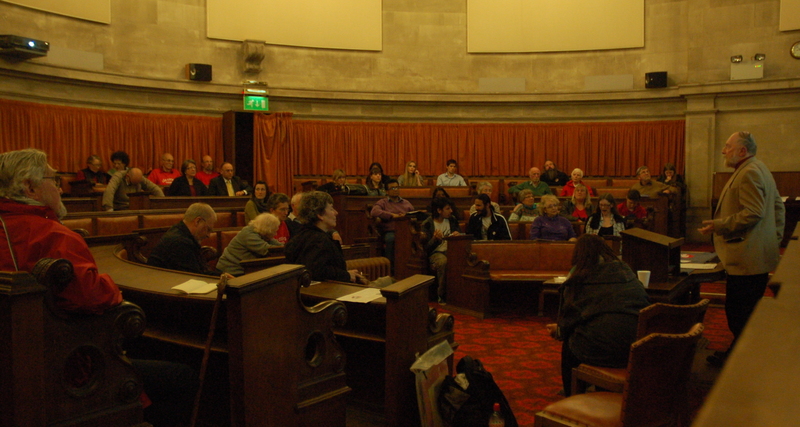 The meeting was organised by United Nations Association (Cardiff & District branch) and CND Cymru and sponsored by the Cardiff University Centre for Applied Ethics. Due to technical problems with the computer in the room we had booked, we were moved to the grand surroundings of the university’s ‘Council Chamber’. 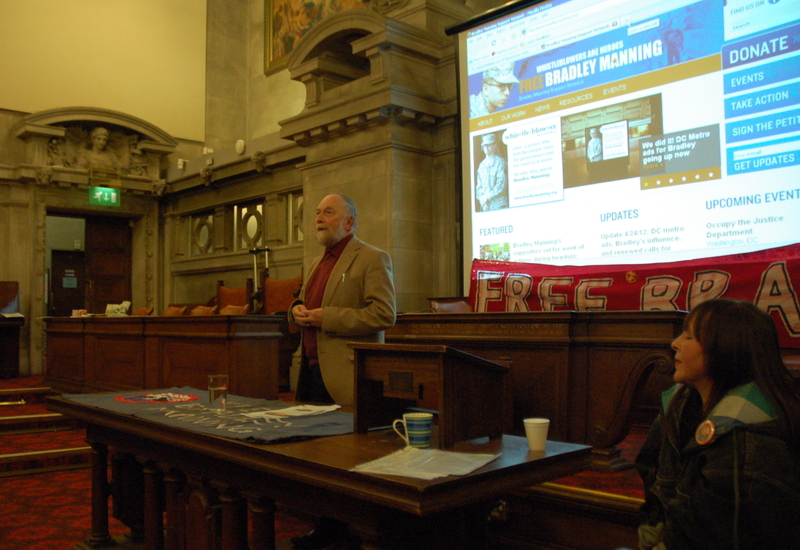 Côr Cochion Caerdydd (Cardiff Reds Choir) opened the evening with a number of songs, Robin Attfield of UNA chaired the first part of the meeting, Genny Bove of WISE Up for Bradley Manning introduced the films and Ray Davies of CND Cymru chaired the discussion after. The ‘Collateral Murder’ footage was shown before the main film and a short news report on the children and the relatives of some of the victims afterwards. 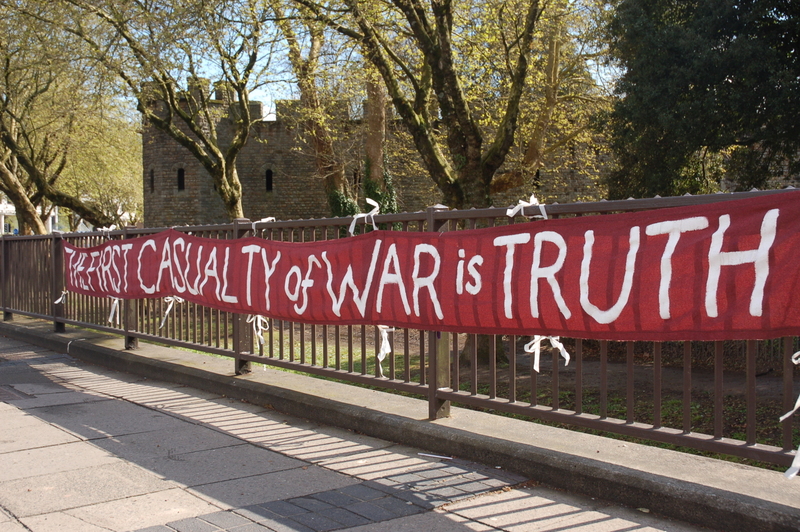 The discussion covered Bradley Manning’s alleged actions, current situation and possible fate, the need for all of us to show solidarity, ways in which perpetrators of war crimes might be brought to justice and some first hand accounts from Iraq. 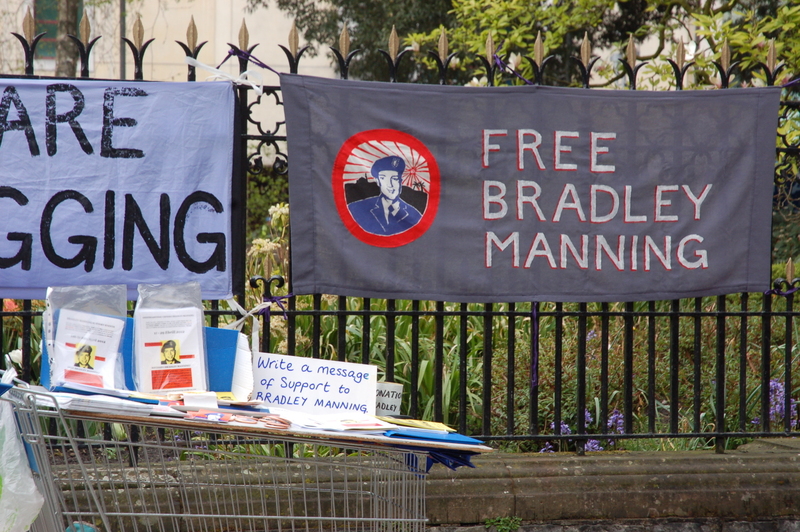 A collection at the meeting raised over £90 which will be donated to Bradley Manning’s defence fund. 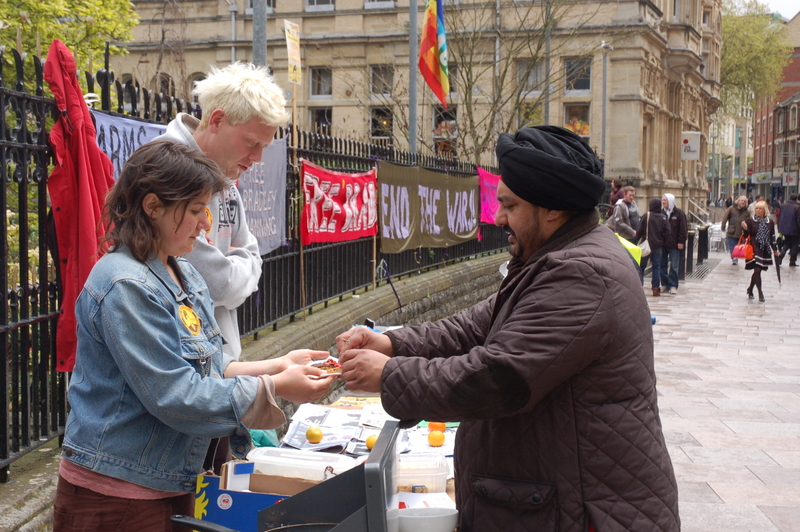 Solidarity events were also held at the US Embassy in London, where Peter Tatchell spoke, at USAF Fairford, outside the court hearing at Fort Meade, Maryland and in about 15 cities around the world.